Modified Bitumen Torch Down Rubber membrane. Select the type of Flat Roof Material you are interested in and see how to make the proper flat roof repairs. Click here to determine what flat roof material you have. 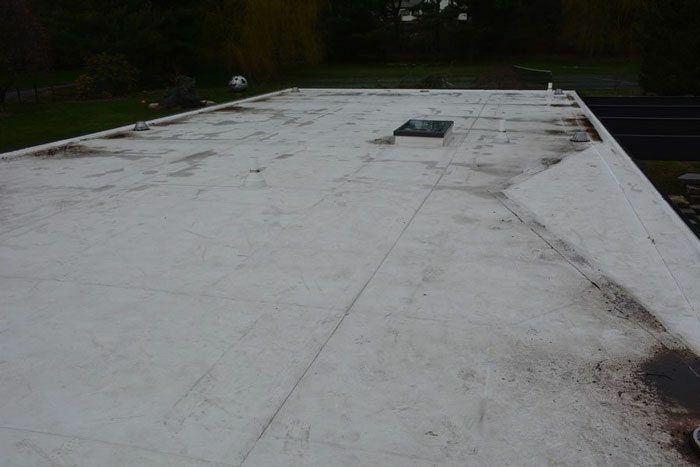 When you want to make a flat roof repair, then it is important that you get the right materials and tools for each different flat roof material. Using the wrong products can ruin the roof membrane and become more costly later on to repair it. This video makes it clear where you should focus on to find leaks. Finding the problem is harder than fixing it.This goes for all flat roof repairs. Watch this video on how easily it is to make any repairs on almost any roof. The important thing to remember is that most flat roof leaks stem from flashing. So, look for flashing issues on skylights, vent pipes, walls and chimneys. Making flat roof repairs with Turbo Poly Seal have been a life saver for me. There are many Home Depot’s and Lowe’s as well as Roofing Supply Warehouses to buy products from to make roofing repairs. Make sure you always buy the highest quality roofing materials to make the necessary flat roof repairs. I provide you brand names that are best to buy in the Flat Roof Repair Guide. 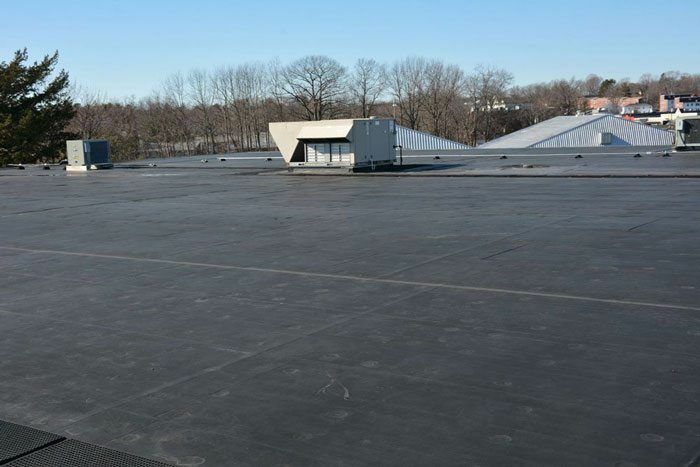 Step 1 – Determine what type of flat roof repair you need to make by determining the roofing materials – is it an EPDM, TPO, Tar, and Gravel or a Torch Down? 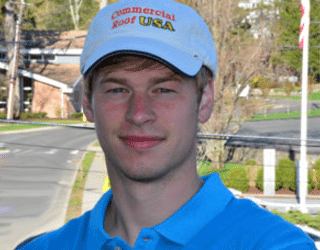 Home Depot and Lowe’s in Pennsylvania have Sub Roofing Contractors that could be available if you needed an experienced flat roof repair person. 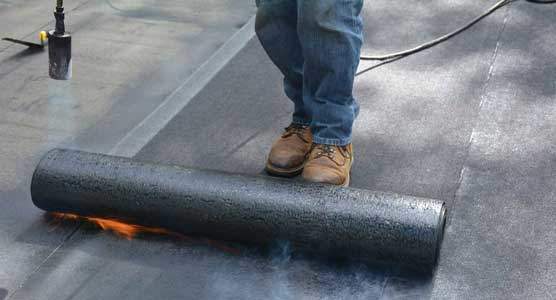 This Video is about “How to Repair a Flat Roof” that has a Torch Down Rubber membrane. Follow the links to see how to make flat roof repairs on different roofing materials. 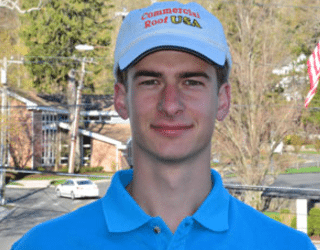 In Pennsylvania, all three types of roofing systems are commonly used. It is not always easy to locate what causes a leak on a flat roof. 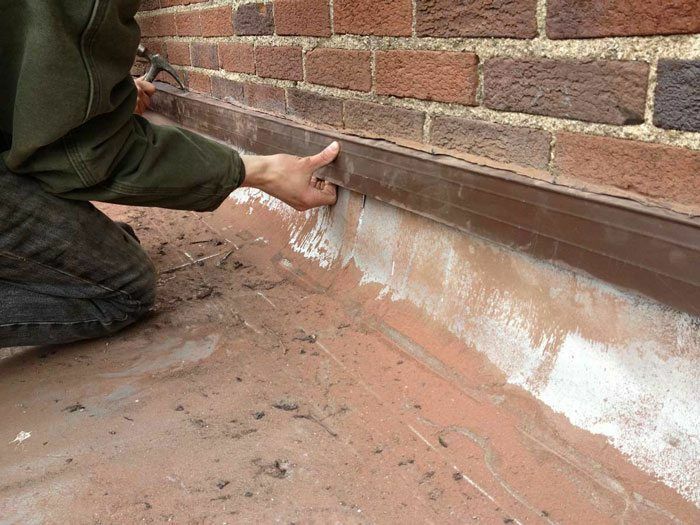 From experience, we know flashing against brick walls, chimneys are very susceptible causing leaks and also Pitch Pockets on commercial roofs are know for causing leaks. Watch the video to see how to look for a leak and then what you are supposed to do to fix a flat roof leak. There are many flat roofs in Pittsburgh that have Pitch Pockets. How to Fix Leaks of on Flat Roofs guide will be a great help. Flat Roof Repair can be as easy as using s little caulk or tar. Finding the leak can be a problem. Look for the obvious. Things that can be obvious are places like flashing, vent pipes, drains, skylights. It should be relatively easy to spot a problem if there is a leak. When it comes to seams, then it is harder to find a leak in the roof. This takes an experienced eye to detect a leak. Flat Roof Repairing is easy to perform once you have located the problem area. Very few tools are required to make a flat roof repair and the cost of repairing is minimal. Wasco is a skylight manufacturing company and has agents that sell their skylights in Pennsylvania. 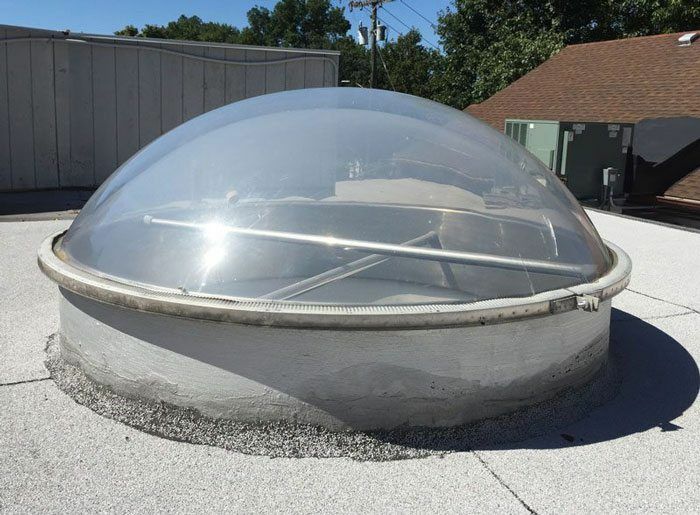 The image above is a Round Domed Skylight made by Wasco. 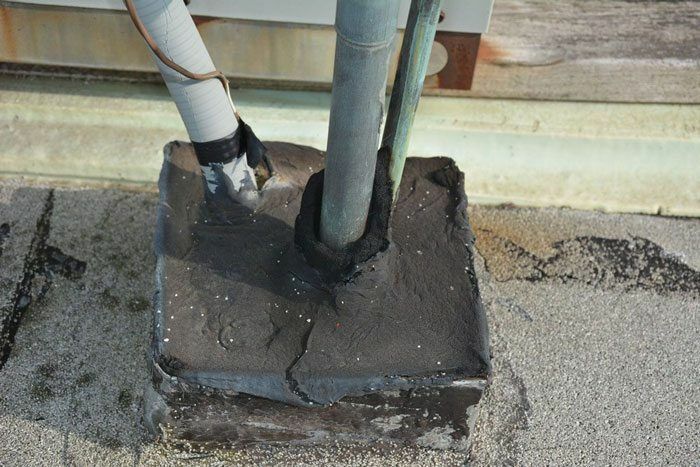 Vent pipes piercing through a rubber membrane can become the cause of a flat roof leak. The rubber gasket or “roof boot” deteriorates over time and crack causing the leak. 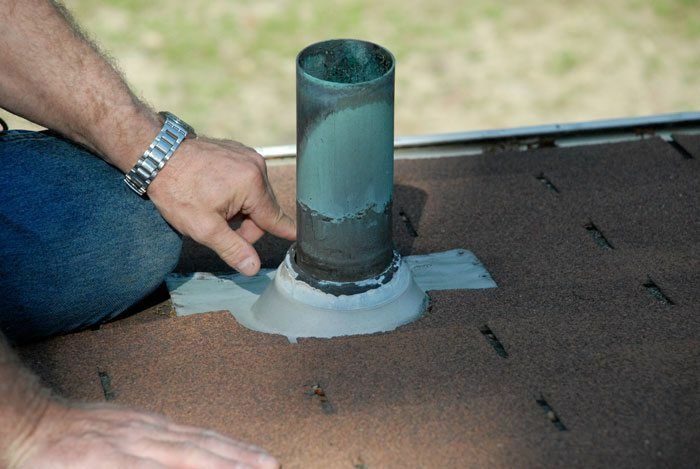 Bathroom Vent pipe with a Roof Boot – To make a flat roof Repair, you need to identify the leak areas. The vent pipes are prone to leak. A Pitch-Pocket is a bottomless container that is placed on a flat roof where airconditioner pipelines and wires are fed through. After the wires and pipes are fed through, the container is filled with liquid “tar” or roof cement to seal around the wires and pipes. Check the pitch-pocket and see if it is full to the brim with tar. Many times this tar will dry and shrink and cause a low spot in the container. When it rains, this low spot will collect water, and water will eventually leak through where the wires and pipelines are. Check the foam insulation that covers the pipelines. This foam deteriorates and causes openings where water can leak through the Pitch-Pocket. As a precautionary step, these pitch-pockets should be filled to the brim at least once a year. 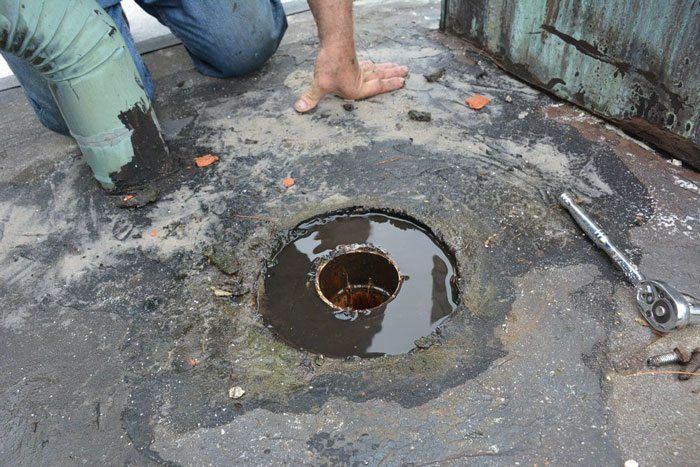 When looking for a leak on a flat roof, always check the pitch pockets to see if the tar in them is filled to the brim. Flat Roof Repairs can easily relate to a Pitch-Pocket that has wires and pipes going through it, and all you need to do is make sure the insulation foam around the pipes is not the cause of the leak. Flashing is probably the biggest cause of flat roof leaks. Many roof technicians will not take their time and make a proper flashing transition from a rubber membrane to flashing. This can be attributed to lack of experience or did not charge enough for the job. 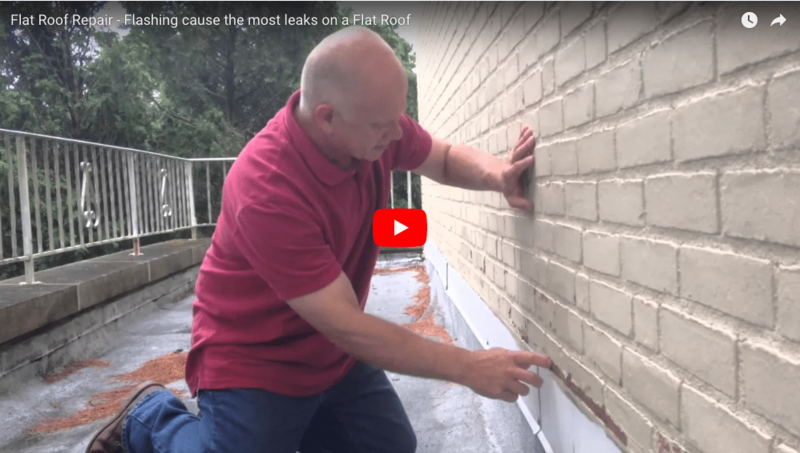 Locating flat roof leaks – This video points out how counter flashing, if not done right, can cause a leak. Counter flashing – whenever flashing is used where a roof meets a wall, there must be proper counter flashing. Counter flashing is when siding or stucco or any other methods are used to cover the flashing from the top side. One should never be able to see the edge of a flashing. The vertical section should be covered by stucco, wood siding, or even other metal. The horizontal part that lies flat on the roof, should be covered by the rubber membrane. Test the rubber adhesion on the metal – try to pull the rubber membrane away from the metal, if it comes up easily, then that could be the cause of the leak. Check for cracked stucco or siding – If the siding or stucco has cracks in it, then the counter flashing is compromised. 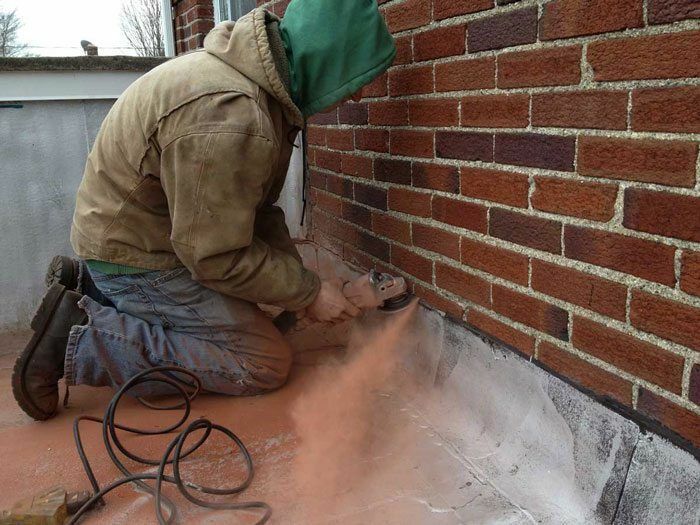 Installing Counter Flashing – To fix the roof leak on this flat roof we had to install counter flashing. We used an angle grinder to cut a slot into the wall where the metal flashing can be inserted. The brick wall in the image shows that the membrane was brought up the wall about 12 ” high. They then adhere to the roofing membrane to the wall. This way of making flashing doesn’t work. The membrane will eventually pull away from the wall. We cut a slot into the brick wall at a 30 degrees angle. After the slot was cut, we inserted a metal counter flashing that hang over the membrane. This is what counter flashing is and how it is done. Flat Roof Repairs mostly involves flashing on flat roofs that were not done correctly. The counter flashing on chimneys is always a problem with chimneys. 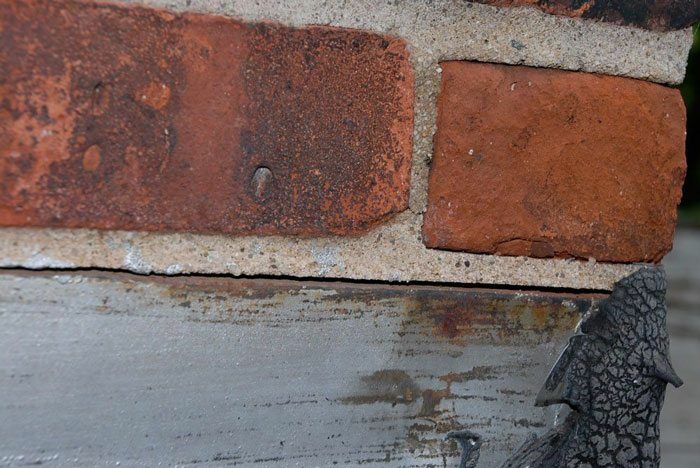 Many times, the counter flashing has to be embedded in the stone or brick wall. This is where most people don’t get it right. Inspect the chimney crown – This is the topmost part of the chimney – Most of the time, these cement slabs crack and causes leaks. Make sure the rubber membrane is properly attached to the flashing on the chimney. When a drain is leaking, it is not always necessarily what causes the leaking. Because the drain is normally lower than the rest of the roof, a leak could start somewhere else and flow towards the drain underneath the roof membrane. 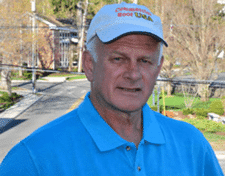 Roofing contractors over 25 years – We fix what other roofers mess up!! This is what a Torch Down Rubber Membrane looks like. The membrane come in three foot wide rolls and the seams are fused together with a torch. When making flat roof repairs on a Torch Down Roof, you can use any petroleum product as in tar, butyl caulk. This roof in the image has a white granular embedded on the surface to protect it from ultraviolet rays. Many times a plain torch down membrane is installed with no granular, then a silver coating must be applied to protect it. This is what an EPDM Rubber Roof Membrane looks like. It is black, and have a smooth surface. The seams can be from ten feet to twenty feet apart. When you need to make flat roof repairs on an EPDM rubber membrane, the first thing to check is the seams. The adhesives that are used to bond the seams together, prematurely fail, due to the extreme heat and ultraviolet. The adhesives that are used to bond the seams together, prematurely fail, due to the extreme heat and ultraviolet. EPDM rubber roofs generally don’t last more than 8 years without severe issues and repairs. This image shows what a TPO Roof Membrane looks like. These roofs are generally good and will last up to 20 years. 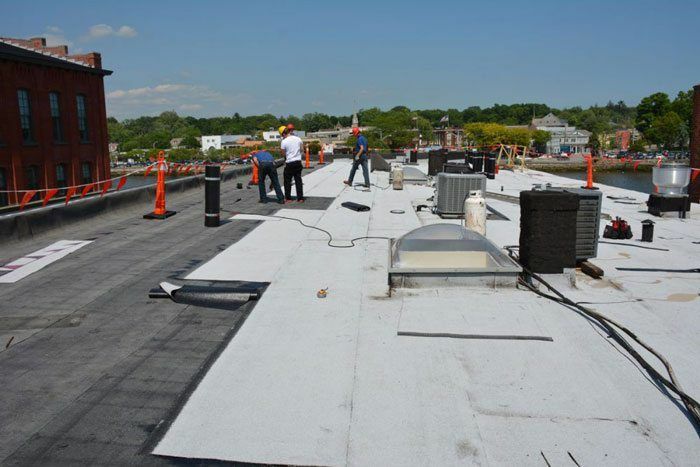 It is a better roof than that of an EPDM Rubber membrane but it is still susceptible to ultraviolet rays. In the video above I showed how the TPO Roof is at its end due to ultraviolet degradation. Erik is my oldest son (roofing contractor) and is 27 years old. He has been in Flat Roof Repairs before he left school during vacations. He has decided to take the business further and keeping it in the family. With all the flat roofing experience and knowledge passed down, you can be assured to get the best service and product. We are Roofing Contractors for the Installation and Repairs of Flat Roofs. With our experience of over 30 years, we can troubleshoot and repair any roof leak. Commercial and residential flat roofs are all the same. Most roofs can be repaired even if they were badly installed. 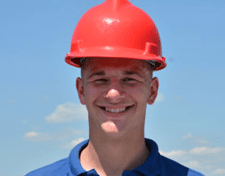 Andre is the second oldest son (roofing contractor) and is 25 years old. He started when he was 16. He has always been hands on all aspects of roofing. When it comes to troubleshooting a leak, he is the one that beats everyone. Now that my sons are running the business, you can be assured of receiving quality service and knowledge that is passed down.